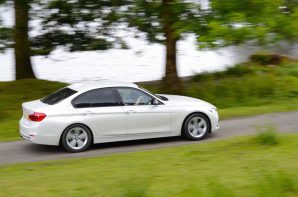 The BMW 3 Series is a firm favourite here at Green Car Guide so there are no prizes for guessing that a petrol plug-in hybrid version is right up our street. The concept of a usable electric range for commuting with the versatility of a hybrid, all wrapped up in the best driver’s car in the class sounds great. So can the 3 Series deliver? On the technical front the picture is pretty rosy. Despite being badged as a 330 you actually get the 2 litre four cylinder TwinTurbo which gets a useful leg up from a slimline electric motor which fits in between the engine and gearbox. The extra performance delivered by the electric side of the system justifies the 330 badging. Power for the motor comes from a 5.7 kWh battery which fits under the boot floor. You loose underfloor storage but the remaining 370 litres of boot space is unaffected. It provides up to 25 miles of electric running (20 miles is realistic) at speeds up to 75 miles an hour. This will enable many to complete day to day trips in purely electric mode offering substantial fuel savings. Of course when you do run out of battery the system reverts to being a hybrid and is capable of recharging the batteries using the petrol engine on the go. You can also tell the system to save battery and select more or less efficient driving modes. Even on long petrol runs in hybrid mode 50+ mpg is achievable proving that the BMW is efficient in hybrid mode too. The 330e is a fantastic option if you want a useful electric range without compromising on driving dynamics. It is so easy to fit into your life it actually makes more sense than a petrol or diesel 3. The electric system adds performance and refinement whilst also delivering substantial company car tax savings, and if you maximise electric running, fuel savings too. What perhaps is most surprising is that the 330e is competitively priced against diesel models and in hybrid mode delivers similar fuel consumption. The 330e is so complete that it earns a coveted ‘Highly Recommended’.